This is the first of many haiku I shall be composing based on the magnificent paintings of the most famous of the illustrious Canadian Group of Seven painters of the early twentieth century, Tom Thomson (1877-1917). Tom Thomson disappeared on Canoe Lake on July 8, 1917. He was presumed drowned. Cet haiku est le tout premier de plusieurs que je vais écrire, qui sont tous basés sur les peintures magnifiques du peintre Tom Thomson ( 1877 – 1917 ), le plus renommé de tous le peintres illustres du Groupe des Sept canadien au début du vingtième siècle. Tom Thomson a disparu au Lac Canoe le 8 juillet, 1917. Il est présumé mort. I have always been deeply fascinated by Alan Turing and Michael Ventris alike, and for obvious reasons. Primarily, these are two geniuses cut from pretty much the same cloth. The one, Alan Turing, was a cryptologist who lead the team at Bletchley Park, England, during World War II in deciphering the German military’s Enigma Code, while the other, Michael Ventris, an architect by profession, and a decipherment expert by choice, deciphered Mycenaean Linear B in 1952. 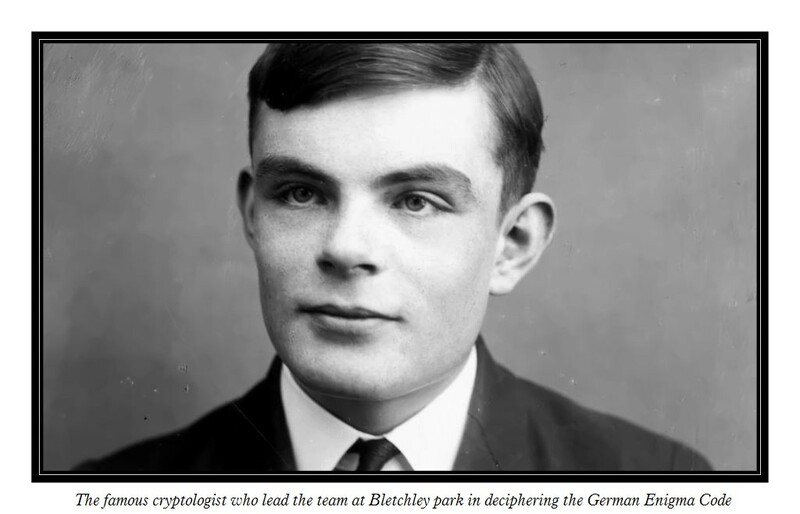 Having just recently watched the splendid movie, The Imitation Game, with great pleasure and with an eye to learning as much more as I possibly could about one of my two heroes (Alan Turing), I decided to embark on an odyssey to discover more about each of these geniuses of the twentieth century. I begin my investigation of their lives, their personalities and their astounding achievements with a comparison of their handwriting. I was really curious to see whether there was anything in common with their handwriting, however you wish to approach it. It takes a graphologist, a specialist in handwriting analysis, to make any real sense of such a comparison. But for my own reasons, which pertain to a better understanding of the personalities and accomplishments of both of my heroes, I would like to make a few observations of my own on their handwriting, however amateurish. Scanning through the samples of their handwriting, I of course was looking for patterns, if any could be found. I think I found a few which may prove of some interest to many of you who visit our blog, whether you be an aficionado or expert in graphology, cryptography, the decipherment of ancient language scripts or perhaps someone just interested in writing, codes, computer languages or anything of a similar ilk. 1. The first thing I noticed were the similarities and differences between the way each of our geniuses wrote the word, “the”. While the manner in which each of them writes “the” is obviously different, what strikes me is that in both cases, the letter “t” is firmly stroked in both the vertical and horizontal planes. The second thing that struck me was that both Turing and Ventris wrote the horizontal t bar with an emphatic stroke that appears, at least to me, to betray the workings of a mathematically oriented mind. In effect, their “t”s are strikingly similar. But this observation in and of itself is not enough to point to anything remotely conclusive. 2. However, if we can observe the same decisive vertical (—) and horizontal (|) strokes in other letter formations, there might be something to this. 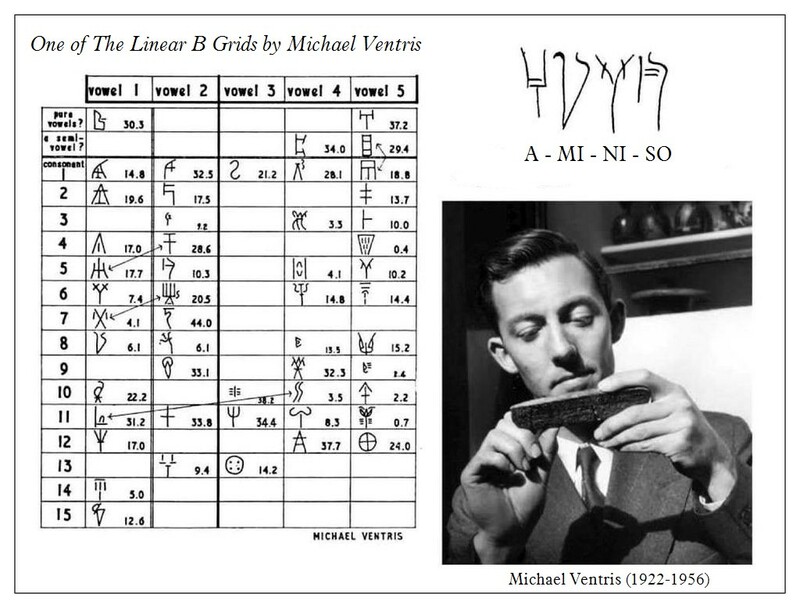 Observation of Alan Turing’s lower-case “l” reveals that it is remarkably similar to that of Michael Ventris, although the Ventris “l” is always a single decisive stroke, with no loop in it, whereas Turing waffles between the single stroke and the open loop “l”. While their “f”s look very unalike at first glance, once again, that decisive horizontal stroke makes its appearance. Yet again, in the letter “b”, though Turing has it closed and Ventris has it open, the decisive stroke, in this case vertical, re-appears. So I am fairly convinced we have something here indicative of their mathematical genius. Only a graphologist would be in a position to forward this observation as a hypothesis. 3. Observing now the manner in which each individual writes curves (i.e. circular and semi-circular strokes), upon examining their letter “s”, we discover that both of them write “s” almost exactly alike! The most striking thing about the way in which they both write “s” is that they flatten out the curves in such a manner that they appear almost linear. The one difference I noticed turns out to be Alan Turing’s more decisive slant in his “s”, but that suggests to me that, if anything, his penchant for mathematical thought processes is even more marked than that of Michael Ventris. It is merely a difference in emphasis rather than in kind. In other words, the difference is just a secondary trait, over-ridden by the primary characteristic of the semi-circle flattened almost to the linear. But once again, we have to ask ourselves, does this handwriting trait re-appear in other letters consisting in whole or in part of various avatars of the circle and semi-circle? 4. Let’s see. Turning to the letter “b”, we notice right away that the almost complete circle in this letter appears strikingly similar in both writers. This observation serves to reinforce our previous one, where we drew attention to the remarkable similarities in the linear characteristics of the same letter. Their “c”s are almost identical. However, in the case of the vowel “a”, while the left side looks very similar, Turing always ends his “a”s with a curve, whereas the same letter as Ventris writes it terminates with another of those decisive strokes, this time vertically. So in this instance, it is Ventris who resorts to the more mathematical stoke, not Turing. Six of one, half a dozen of the other. While the handwriting styles of Alan Turing and Michael Ventris do not look very much alike when we take a look, prime facie, at a complete sample overall, in toto, closer examination reveals a number of striking similarities, all of them geometrical, arising from the disposition of linear strokes (horizontal & vertical) and from circular and semi-circular strokes. In both cases, the handwriting of each of these individual geniuses gives a real sense of the mathematical and logical bent of their intellects. Or at least as it appears to me. Here the old saying of not being able to see the forest for the trees is reversed. If we merely look at the forest alone, i.e. 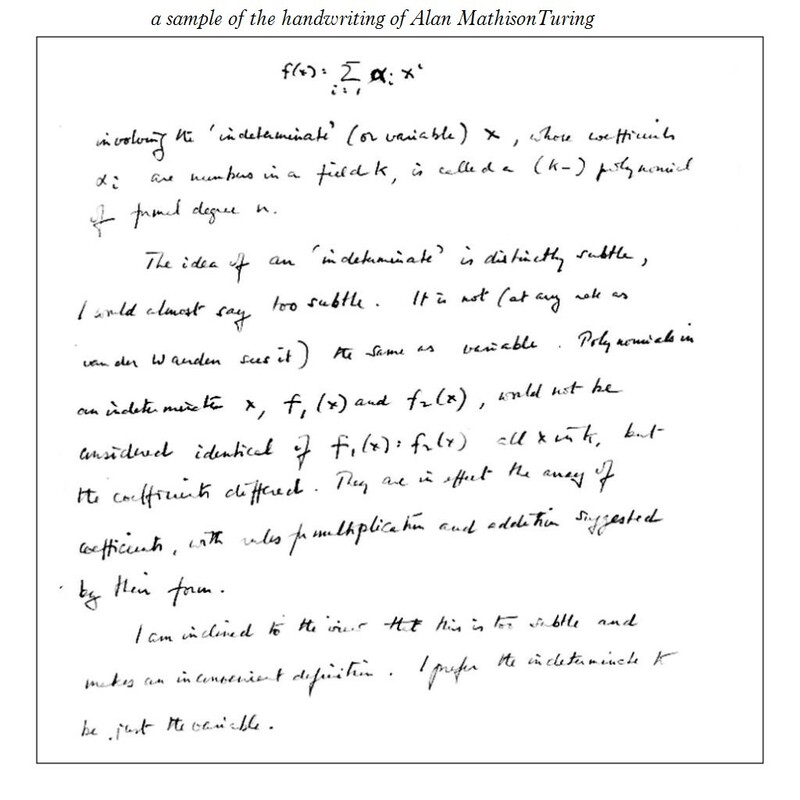 the complete sample of the handwriting of either Alan Turing or Michael Ventris, without zeroing in on particular characteristics (the trees), we miss the salient traits which circumscribe their less obvious, but notable similarities. General observation of any phenomenon, let alone handwriting, without taking redundant, recurring specific prime characteristics squarely into account, inexorably leads to false conclusions. Yet, for all of this, and in spite of the apparently convincing explicit observations I have made on the handwriting styles of Alan Turing and Michael Ventris, I am no graphologist, so it is probably best we take what I say with a grain of salt. Still, the exercise was worth my trouble. I am never one to pass up such a challenge. Be it as it may, I sincerely believe that a full-fledged professional graphological analysis of the handwriting of our two genius decipherers is bound to reveal something revelatory of the very process of decipherment itself, as a mental and cognitive construct. I leave it to you, professional graphologists. Of course, this very premise can be extrapolated and generalized to any field of research, linguistic, technological or scientific, let alone the decipherment of military codes or of ancient language scripts. Many more fascinating posts on the lives and achievements of Alan Turing and Michael Ventris to come!